The University of Bern is part of the international "Blue Community" initiative that campaigns to recognize water as a human right and a public commodity. As a "Blue University", it takes its water from the public supply – i.e. tap water – and avoids transported, commercially available bottled water as much as possible. The university has produced refillable, recyclable water bottles for students and employees in order to reinforce this message. These bottles can be filled with fresh water at any tap or water fountain. The university cafeteria operators ZFV also offer carbonated drinking water from the tap at several locations around the University of Bern at an affordable price. 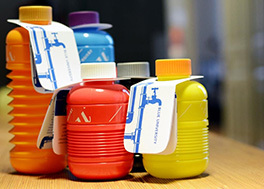 These bottles are handy, light and can be adjusted in size (0.3 to 0.7 liters) so that they fit in bags of all kinds. They are available in nine different colors. Bottles can be bought directly at the ZFV locations. For orders of more than 50 pieces, please contact email, or Nathalie Wohlhauser, telephone 031 631 32 00. These water bottles are sustainable and quintessentially Swiss! They are made entirely of polypropylene, which has the advantage over other plastics of a closed-loop recycling system. They can be disposed of at the milk bottle recycling points at plastics return stations. The bottles were designed in Thun and are produced by a small company in the Canton of Basel-Landschaft.